Alpheus Smith was born in Phillippi, West Virginia in 1876. After graduating from West Virginia University with an AB degree in 1900, he pursued his graduate studies at Harvard University and obtained his Ph.D. in 1906. After positions at Bowdoin College, Haverford College and the University of Wisconsin, Dr. Smith came to the Ohio State physics department in 1909 as an assistant professor. His research specialties were galvanomagnetic and thermomagnetic effects in metals and alloys. 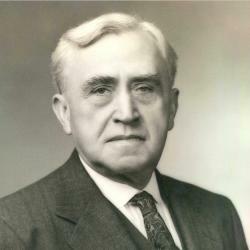 In 1926 Prof. Smith became the 5th chairman of the physics department and held that position for 20 years. In addition, Alpheus Smith served as the Dean of the Graduate School from 1939 to 1946. Dr. Smith completed his 49 years of service to Ohio State University as President of the Research Foundation from 1946 to 1958. Alpheus Smith was a Fellow of the American Physical Society and of the American Association for the Advancement of Science. He received numerous awards including the Distinguished Service Citation from Ohio State University, the Air Force Medal of Exceptional Civilian Service, and honorary degrees from Ohio Wesleyan University, Capital University, and Ohio State University. The Smith Lecture began in 1960 and is currently funded by an endowed gift from the Smith family to honor Alpheus Smith. The lecture is given yearly by a physicist renowned not only for their scientific achievements but also for the ability to communicate their scientific breakthroughs to the general public. Of the Smith Lecturers, 31 have been Nobel Prize winners.